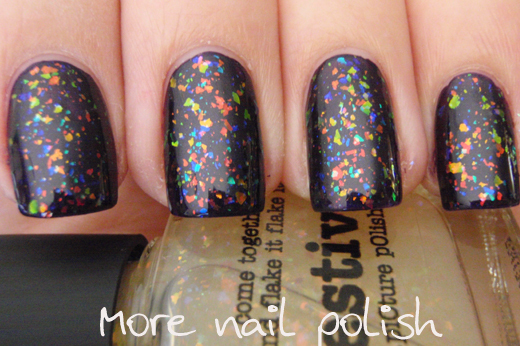 I'm so very happy to share with you today, Picture Polish's new Festival flakie top coat. I'm so excited to see them release this polish, as it is something very unique in the Australian market. 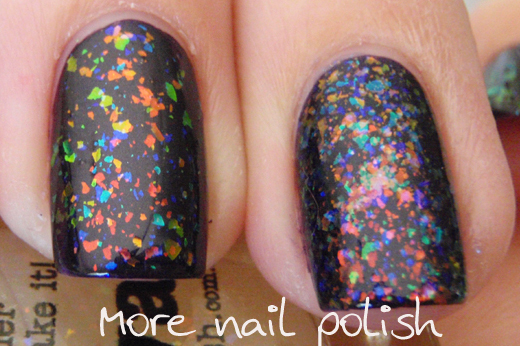 Festival flakie cover is a multicoloured flakie polish in a clear base. Now it's really difficult to tell what colour flakies are actually in this, because a number of them a duochrome flakes and change colour on different angles. But what I can tell you is the colours I see, and they are green, yellow, orange, blue, teal and an occasional purple/pink. 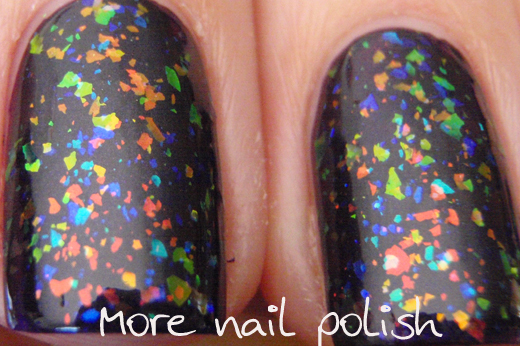 These pictures are three coats layered over Picture Polish Aphrodisiac. So I know the first thing you're wondering is how does this compare to Cult Nails Clairvoyant? This next swatch shows three coats of Festival on the left and three coats of Clairvoyant on the right. I did three coats because I wanted to show the difference in the flakie coverage. In general terms, they both have the same flake colours, from what I can see. But clearly Clairvoyant has lots more flakies in it. This isn't a great swatch of Clairvoyant cause I got a really large flake right in the middle of my nail, an then all the other flakes got stuck on it. Clairvoyant also has more of the pink/purple flake than Festival does. The other thing I noticed was Clairvoyant had a rougher finish. 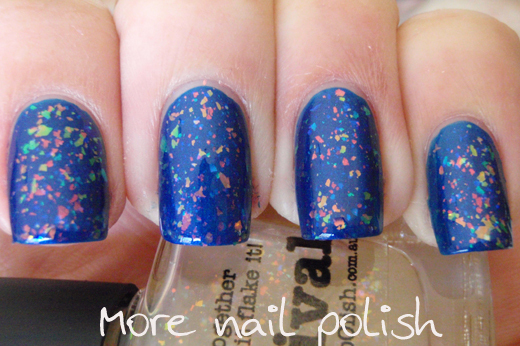 Festival is really very smooth, these photos have no top coat and Festival has a really beautiful cabochon effect. 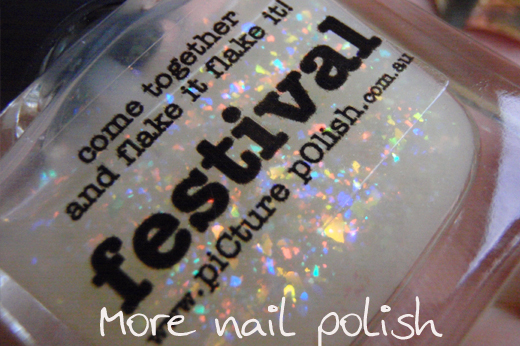 I love this photo of the Festival bottle cause it looks so much like a white opal! Here is Picture Polish Aphrodisiac on it's own. 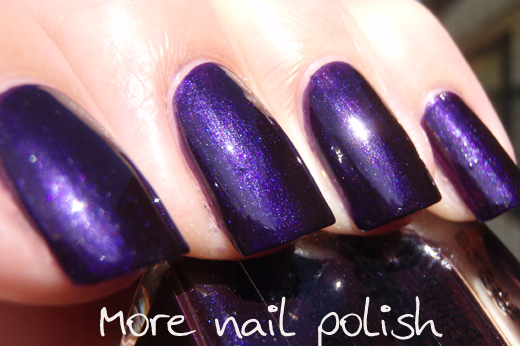 It's very dark indoors, but in the sun you can see what an amazing rich purple shimmer polish this is. 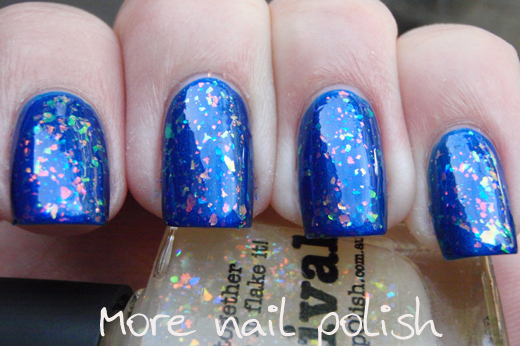 I also tried Festival over Picture Polish Bombshell, which I have shown on it's own here. 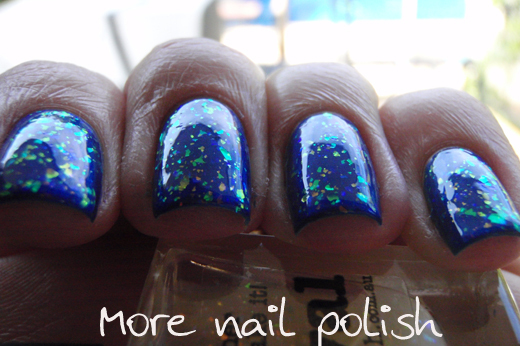 The outdoor reflection in this is pretty extreme, but I was trying to capture some of the multichrome shift. Over all, I'm really impressed with this polish. The flake colours are beautiful, the formula is great and finishes really shiny without the need for a top coat to smooth it out. The only improvement it could have would be a more dense flakie coverage. That way I wouldn't have to do as many coats. I'm guessing these Picture Polish flakie covers will be quite similar to the new Finger Paints ones that are officially released in January. But given that Finger Paints are very difficult to get here, in Australia, I'm so glad I have easy access to these beautiful polishes. I can't wait to get the other new flakie colours too! These can be purchased from piCture pOlish for $11.90. 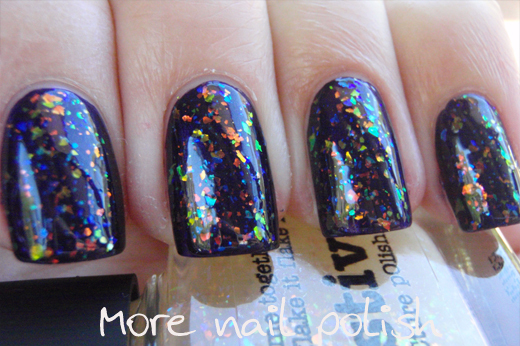 That is a stunning flakey polish with the bonus of finishing smooth... gotta love that. Oh, it's so beautiful! Can't wait for mine to arrive! I got mine this week, it's so gorgeous! I can't wait for the others either. I just received Festival in the post yesterday -- I'm head over heels! I think flakies are the next "big thing". At least I'm hoping! So many companies are coming out with some cool ones. 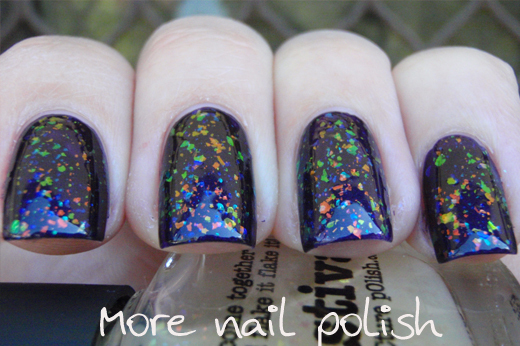 Deborah Lippmann, Picture Polish, FingerPaints... I'm excited!!! Thanks for the comparisons! Now to wait until my Sally's gets those Finger Paint flakies in! I'm glad flakies are becoming more popular. I just got Clairvoyant, so I'll be giving this one a miss, but if I didn't, it would definitely have been mine.